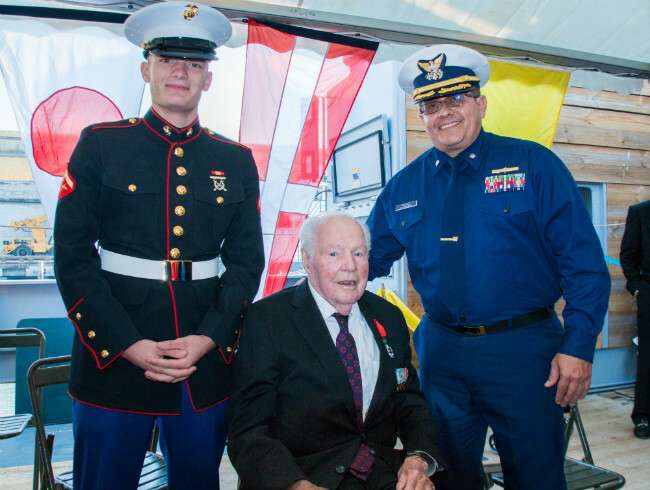 As a 22-year-old deck officer in command of a gun crew on a US Navy Landing Ship Tank (LST), Thomas Cooney helped launch the 1st Infantry’s “Big Red One” Army unit on Omaha Beach on D-Day. The ship and its men in the landing force took heavy fire on June 6, 1944, until an American destroyer bombarded the German gun emplacement and put it out of action. 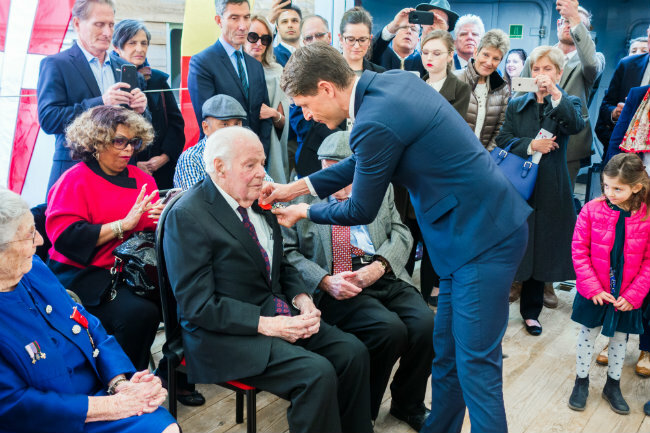 As a 97-year-old retired Navy officer, Cooney was bestowed the rank of Chevalier (Knight) in the Legion of Honour by Emmanuel Lebrun-Damiens, French Consul General of San Francisco, this past Sunday, November 11. The ceremony was timed with world-wide centennial commemorations of Remembrance Day/Armistice Day which honours the signing of the armistice that halted World War I. Cooney was awarded the Chevalier for having fought for the liberation of France. The Legion of Honour Chevalier is France’s highest award and is given to French citizens or foreign nationals, men and women, for outstanding achievements in military or civilian life. 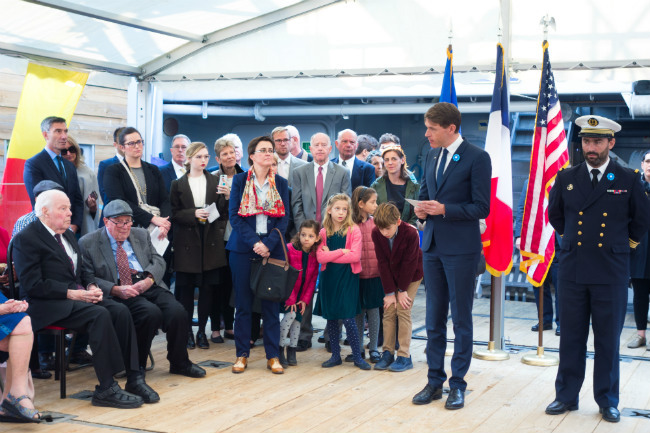 In 2014 on the 70th anniversary of the Allied invasion, then French President François Hollande declared that the Chevalier would be awarded to all veterans who fought for the liberation of France during the Second World War. To be eligible, living veterans of any U.S. branch of the military must have fought in the four main campaigns for the liberation of France – Normandy, Provence, Ardennes or Northern France – between October 1943 and May 1945. So far, 4020 veterans have been decorated. Each eligible veteran can fill out a two-page application form and, along with military records and honorable discharge, submit it to their closest French Consulate. 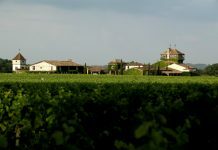 Once the application is verified to meet requirements, it is submitted for review and validation to the French Ambassador in Washington, D.C. before being sent to la Grande Chancellerie, the Legion of Honour committee in Paris. 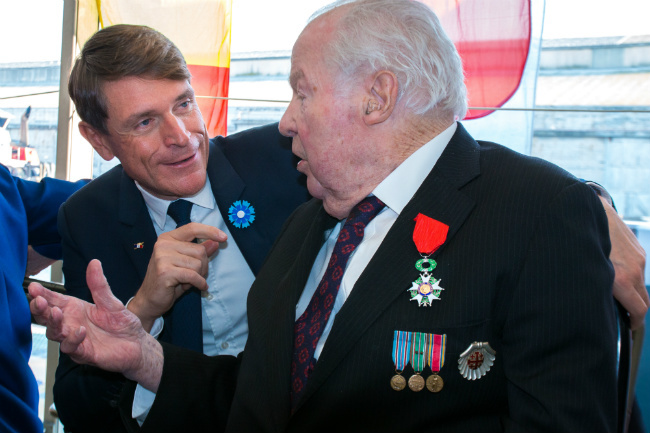 Once approved, the French President signs a decree that allows the veteran to be honoured. According to Matthias Carette, San Francisco French Consulate Press and Communications Attaché, in 2018 the French Consulate in San Francisco received 23 new applications which are now being reviewed in France. In San Francisco this year, 21 U.S. veterans have been decorated in four ceremonies. Cooney applied in 2016, inspired after a visit to Normandy where he heard about the Legion of Honour program. There were approximately 125,000 American personnel who took part in the Normandy landings in 1944 and it is estimated that there are less than 5,000 alive today. According to the U.S. Department of Veterans Affairs, of the 16 million Americans who served in all of WWII, only 496,777 are alive in 2018 and they are in their late 80s and 90s. The 75th anniversary of the D-Day landings will be in June 2019. This event promises to be celebrated widely, honouring the veterans and civilians who fought and died not only for the liberation of France, but also to bring an end to the Second World War. Cooney’s combat career started on D-Day, surviving the first 24 hours at Omaha Beach. Orders then arrived that moved the LST west to England to pick up more troops, tanks, gasoline ammunition and supplies, according to a 2016 San Francisco Chronicle article. He then spent months on the LST shuttling troops, supplies and even German prisoners between England and France. He was shipped back to the U.S. and spent New Year’s Eve 1944 with his parents in Yonkers, NY. Cooney was then sent to oversee an ammunition loading dock in Suisun Bay, the military port in San Francisco Bay. It took him 10 years to return after the end of the war, but he and his wife moved to San Francisco where he worked as a buyer at the White House department store on Grant Avenue. According to several historians, the White House was known for its French atmosphere and had a passing resemblance to Au Bon Marché in Paris. 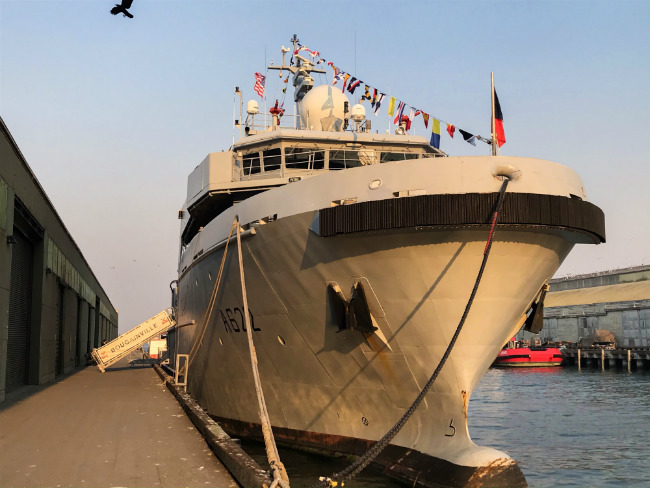 The November 11 Legion of Honour awards ceremony was held on a French Bougainville multi-mission ship moored in San Francisco Bay.